Visual Studio Code>Themes>Monokai ProNew to Visual Studio Code? Get it now. Beautiful functionality for professional developers, from the author of the original Monokai color scheme. 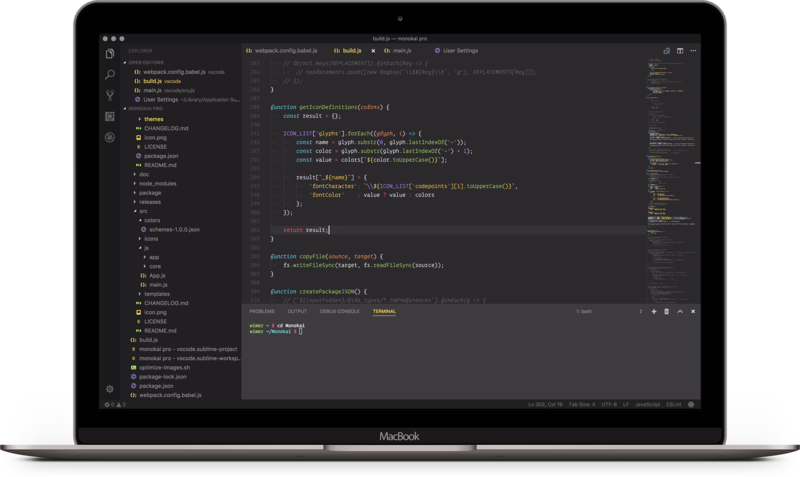 Monokai Pro is a color scheme, customized user interface theme and complete icon set for Visual Studio Code. It has been designed by the author of the original Monokai colors. Carefully selected shades of colors are the foundation of an uncompromising, non-distractive user interface. The single goal of Monokai Pro is to let you focus on your code. The icons of Monokai Pro have all been created from scratch to ensure they are easily recognizable on small sizes in the side bar. They are designed to help you quickly find the right files in your project.